Year Month Day Mine County Owner or Company Name Surname Age Occupation Category Cause of accident & remarks Extra details? 1905 January 9 Rigfoot Colliery Ayr Lanemark Coal Co. Ltd. William Gillespie 59 Labourer On surface  On railways, sidings, or tramways A waggon in which he was working at the scree was moved by the locomotive while shunting, and he was crushed against the moveable scree. 1905 January 12 Cadzow No 2 Pit Lanark Cadzow Coal Co. Ltd. Wm. Gilmour 28 Miner Falls of roof Fall of arching and roof on haulage road while passing along it. Another man was injured. 1905 January 12 Whitehill Edinburgh Lothian Coal Co Ltd James Neil 53 Miner Falls of roof Deceased had taken down coal, and was propping the roof, when it fell upon him. 1905 January 15 Carnock No 1 Pit Stirling Alloa Coal Co. Ltd John Crawford 33 Sinker Shaft accidents  whilst ascending or descending by machinery In descending in the kettle with other four men, he fell out when his neighbour stepped off the kettle to secure an air pipe 9 1/2 fathoms from the bottom of the shaft. Only four men should have been on the kettle at one time. 1905 January 17 Gartcosh Mine (Fireclay mine) Lanark Glenboig Union Fireclay Co. Ltd John Campbell 43 Winding engineman On surface  sundries While on a ladder pouring naphtha on a frozen vertical feed pipe, the naphtha ignited at a fire on the ground, and the flask containing the naphtha bursting, he was burnt. 1905 January 19 Dechmont No 2 Pit Lanark Archd. Russell, Ltd. Alexr. Griffin 19 Miner Falls of roof Fall of roof at brushing face while holing. Apparently the propping regulations were not complied with. 1905 January 20 Holytown No 8 Pit Lanark James Nimmo & Co., Ltd. Robert Russell 23 Miner Falls of roof Fall of roof on road while repairing it. He died on 17th May. 1905 January 26 Shieldmains No 2 Pit Ayr A. G. Moore & Co. Robert Brown 53 Reddsman Shaft accidents  whilst ascending or descending by machinery While ascending the shaft the cage got detached from the rope, owing to the cotter of the pin, which went through the muzzle giving way. Another man was injured. 1905 January 30 Minto Fife Lochgelly Iron & Coal Co Ltd John Steuart 21 Labourer On surface  railways, sidings or tramways Several waggons were moving too fast on an inclined road, and deceased in attempting to stop them was run over. 1905 February 3 Balbardie Linlithgow Balbardie Colliery Co Ltd Thomas Murphy 30 Miner Falls of roof Deceased had removed the bottom part of seam, and was taking down the top coal, when the coal and roof came away from between two unseen lypes and crushed him. 1905 February 6 Balgonie Fife Charles B Balfour Robert Law 27 Drawer Deaths not comprised under Mines Act While proceeding- on his way homeward after his shift was over, he took a shock of apoplexy, and died. 1905 February 10 Earlseat Fife Wemyss Coal Co Ltd James Anderson 44 Miner Falls of roof Deceased had fired a shot and on returning to examine the work it had done, the roof fell on him and injured his spine. He died on 15th May. 1905 February 16 Daldowie Pit Lanark Glasgow Coal Co., Ltd. Edward Brady 37 Miner Falls of roof Fall of roof at working face when about to prop it. The specified distance for props seems to have been too great. 1905 February 17 Douglas Lanark Coltness Iron Co Ltd Robert Beattie 50 Miner Deaths not comprised under Mines Act Deceased suffered from heart trouble, and he took ill in the pit; in walking out-bye he suddenly expired. 1905 February 17 Orbiston No 3 Pit Lanark Summerlee & Mossend Iron & Steel Co. Ltd. Joseph Smith 27 Miner Falls of roof Fall of roof in working place. 1905 February 20 Lochwood No 3 Pit Lanark Lochwood Coal Co., Ltd Wm. Love 33 Bencher Falls of roof Fall of roof on road while attaching hutch to incline rope. 1905 February 24 Prestongrange Haddington Summerlee Iron Co Ltd William Craig 20 Sinker Shaft accidents - falling from part way down The shaft was enlarged for the purpose of pumping and winding coal from a seam 35 fathoms from the bottom ; the permanent set of pumps was practically completed to the top lift 50 fathoms from surface, and the scaffold at the place was removed on the morning of the accident by deceased and two other sinkers. On descending in the cage two hours later, deceased signalled to stop at the top lift and jumped to alight on the scaffold, forgetting for the moment that it had been removed, and was precipitated down the shaft. 1905 February 28 Bothwell Castle Nos 1 & 2 Pit Lanark Wm. Baird & Co. Ltd John Boyle 23 Drawer Haulage  Run over or crushed by Trams or Tubs When taking a hutch down a road a drawer behind lost control of his full hutch, owing, it is said, to a snibble having broken, and the latter hutch ran down and caught him. 1905 March 2 Dechmont Colliery Lanark Archd. Russell, Ltd. John McGoldrick 23 Miner Haulage  Ropes or chains breaking Going up a cuddie brae with a hutch the rope broke, and the cuddie or balance bogie ran down and caught him. 1905 March 7 Holytown No 12 Pit Lanark James Nimmo & Co., Ltd. John Greenlee 40 Road repairer In shafts  miscellaneous While working at the pit bottom he and the overman stepped into the cage seat after the latter told another man to signal down the cage. The cage in response to the signal was lowered, and both of them were crushed by it. 1905 March 10 Gartshore No 1 Pit Dumbarton Wm. Baird & Co. Ltd John Martin 48 Reddsman Explosions of Fire-damp or Coal Dust When redding a fall on a road his naked light ignited gas. From Main body of report: The fatal explosion took place in Gartshore No 1 Pit. The deceased had been sent to clear away a fall of roof on a road at a point where it crossed a fault. His statement and that of a roadsman who was with him was to the effect that while at work a fresh fall brought down gas from the cavity and it was ignited by his naked light. The pit is in the process of being sunk, the winding being done by coupled 20-inch cylinder engines. The pithead frame gave a height of about 30 feet between the landing scaffold and the centre of the pulley. The two men were ascending to the surface in the kettle when in some unexplained manner the engineman drew them up to the pulley and they fell out, the one down the shaft which at the time was 101 fathoms deep, and the other to the landing scaffold. 1905 March 15 Hamilton Palace Colliery Lanark Bent Colliery Co. Ltd John Ferguson 24 Miner Shaft accidents  falling from part way down He opened the gate at the mid-working of a blind pit, pushed a hutch into the open shaft, and fell after it to the bottom. There was no bottomer as required by the Special Rules. From Main body of report: At Hamilton Palace Colliery, a miner fell down a blind pit from a mid-working and was killed. This blind pit is sunk from the Ell to the Splint Coal, a distance of some 25 fathoms. The Main Coal is midway between the seams, and coal was raised from the Main Coal to the Ell Coal by a compressed air engine. There was no scaffold across the shaft at the Main Coal, as there might have been, and the mid-working was fenced by a gate connected in the usual manner with an indicator in the engine-house. There being no bottomer appointed to perform the duties prescribed by the Special Rules, the drawers acted as bottomers for themselves. It appears that the deceased opened the gate when the cage was at the Ell Coal, and apparently under the impression that the cage was opposite him, pushed a loaded hutch into the open shaft and fell after it to the Splint Coal. Where possible, a scaffold should always be placed across the shaft at a mid-working. The is no excuse for working with an open shaft below a mid-working unless the cage has to descend to a lower level, as, in spite of every other precaution, workmen sometimes make mistakes such as occurred in this case. 1905 March 18 Newbattle Edinburgh Lothian Coal Co Ltd James Reid 37 Miner Falls of roof Deceased wan engaged laying rails on a dook road at an upthrow fault, when a fall took place, and he was fatally injured. 1905 March 19 Holytown No 13 Pit Lanark James Nimmo & Co., Ltd. Matthew Myles 28 Night fireman Haulage  sundries Killed by a shock of electricity by his head coming in contact with live part of an electrical coal-cutting machine. From Main body of report: In Holytown No 13 Pit, Lanarkshire, a fireman was killed by an electric shock. He was assisting to work a Morgan Gardner coal-cutting machine in the Lower Ell Coal seam where the height of the working face was 18 inches. This machine was worked by electricity, with a continuous current of 500 volts. The terminals of the power cables were inserted in holes drilled through studs projecting beyond one end of the machine, and the end of each cable was held fast by a brass pinching screw, which was only partially insulated by a vulcanite washer kept in position by a nut screwed against it, the head of the pinching screw going right through the vulcanite washer. The two pinching screws were three inches apart. It seems that the machine had been stopped to shift the haulage appliance, and the deceased was asked by his neighbour to give him some more slack rope. In order to do this he had to put his hand into the gearing from the end of the machine, and apparently while doing so his left ear and face came in contact with the live heads of the pinching screws, and he received a shock of electricity which killed him. The electrical engineers who supplied the pinching screws with the vulcanite washers ought to have known better than employ such such an imperfect method of preventing contact by the workmen with live parts of the machine. 1905 March 22 Allanton No 2 Pit Lanark Wm. Barr & Sons James Hamilton 20 Miner Shaft accidents  whilst ascending or descending by machinery When ascending the shaft he fell off the cage. He seems to have taken a fainting fit. 1905 March 23 Aitken Fife Fife Coal Co Ltd Andrew Black 26 Brusher Falls of roof Deceased was engaged putting a building on the low side of a level which had been brushed, when a large stone fell away from between two lypes and killed him instantaneously. 1905 March 23 Blantyre No 1 Pit Lanark Wm. Dixon Ltd John Cox 58 Oncostman Shaft accidents  whilst ascending or descending by machinery While ascending the shaft, in some unknown manner he fell off the cage. 1905 March 25 Cadzow No 2 Pit Lanark Cadzow Coal Co. Ltd. Thos. Riley 38 Oncostman Falls of roof Fall of roof on road while repairing it to get access to stoops. 1905 March 25 Polton Edinburgh Lothian Coal Co Ltd John Ross 64 Fireman Falls of roof Deceased was repairing an airway on an idle day, and just as he knocked out some props the roof collapsed and he was killed. 1905 March 27 Broxburn (Oil shale) Linlithgow Broxburn Oil Co Ltd Michael Brogan 32 Miner Falls of side The holing is in the centre, and bottom shale is taken away first, afterwards the top shale, which generally overhangs and is supported by sprags. Deceased was found under the top shale which came away from a " dry " parting. There were no sprags up to the shale. 1905 March 30 Hassockrigg Lanark Coltness Iron Co Ltd Francis McCartney 48 Miner Falls of roof While deceased was working at the face the roof suddenly fell upon him. The roof was composed of sandstone with clay joints and lypes, and stone fell away from between them. 1905 March 31 Prestonlinks Haddington Forth Collieries (1903) Ltd John Docherty 25 Bricklayers labourer On surface  miscellaneous Deceased attended on the bricklayers, who were engaged in the erection of a washery. His duties were to carry the bricks from a scaffold 25 ft. from the ground to the bricklayers. The bricks were raised in a box to this scaffold by means of a steam crane, and in landing a load the craneman dropped the box so recklessly that the supports of the scaffold gave way and scaffold fell carrying him with it. 1905 April 5 Cadder No 15 Pit (Ironstone) Lanark Carron Co. Wm. Douglas 44 Roadsman, &c. Haulage  Run over or crushed by Trams or Tubs When working on an endless rope dook he failed to keep clear of an upcoming full hutch, and was run over by it. He died on 17th August. 1905 April 6 Craighead No 2 Pit Lanark Wm. Baird & Co. Ltd Peter Somodis 22 Miner Falls of side Fall of stone (falling) in his working place. He failed to have it spragged while working below it. 1905 April 7 Ormiston Station Haddington Ormiston Coal Co Ltd John Hogg 15 Haulage engine driver On surface  railways, sidings or tramways Deceased was assisting to move railway waggons at the screens, and was crushed between the waggon buffers. From Main body of report: A boy under 16 years of age was fatally crushed between the buffers of two waggons, and on investigating the cause it was discovered that the pitheadman was in the habit of getting the boy to assist in moving the waggons. Proceedings were taken against the pitheadman, and he was convicted. 1905 April 14 Batonrigg Lanark United Collieries Ltd James Shields 17 Drawer Other haulage accidents Deceased and two other boys were on their way home after finishing their day's work. He and another got into an empty tub, and the third boy pushed; owing to the dip out bye a snibble was inserted in one wheel, and at a stiff part of the work this was withdrawn. The boy lost control of the tub at another dipping part and the tub ran away and collided with a stationary loaded rake. 1905 April 17 Craig No 1 Pit Ayr Wm. Baird & Co. Ltd John Highland 65 Sinker Miscellaneous Underground Accidents  By explosives A shot of gelignite in a sinking pit with too short a fuze went off just as he was being lifted in the kettle, and he fell out. Other four shots went off on him. 1905 April 18 Wallyford Edinburgh Edinburgh Collieries Co Ltd Percy Baker 21 Miner Falls of roof Deceased was shovelling coal at the road-head, when a stone weighing 2 lbs. fell from the roof and struck him on the back of the neck. He died next day from the injury. 1905 April 20 Duddingston Shale Mine Linlithgow Oakbank Oil Co Ltd Daniel Peste 28 Roads man Deaths not comprised under Mines Act Deceased was assisting to carry a piece of machinery when he took a fit of coughing and vomited blood, dying in about an hour's time. 1905 April 21 Little Raith Fife Lochgelly Iron & Coal Co Ltd Robert Beveridge 16 Drawer Haulage  run over or crushed by trams & tubs Deceased was preparing to run a full tub down a short brae dipping 1 in 3 1/2, and got in front to adjust it to the rails when it moved forward and pushed him in front to the level below where he was fatally crushed. 1905 April 22 Lassodie Mill Fife Fife Coal Co Ltd George Cooper, sen 40 Miner Falls of roof A blind shaft, 10 fathoms deep and fitted with ladders, is situated on the direct road for communication between the Dunfermline Splint Coal workings, and the outlet shaft. This road being shorter and easier to travel than the haulage road from the winding shaft, was used by the men of a section to travel to and from the faces. Work was finished for the day and deceased with his son and nephew were proceeding homewards, and while ascending the ladders the roof at top of blind shaft fell and part came down the shaft, extinguishing their lights. As they were the last men to leave the section they were left in a helpless condition, and it was only when their relatives becoming anxious at their prolonged absence, was it discovered that they were still in the mine, and on a search being made they were found in the shaft; deceased was found firmly pinned against the side by a large stone, and died shortly after he was released. 1905 April 25 Caledonia Mine (Fireclay) Renfrew Spiers, Gibb & Co. Wm. Purss 34 Miner Falls of side Fall from the side of a road while enlarging it. Contrary to the manager's instructions he was drilling a hole in the strata which was known to be insecure. Another man was injured. 1905 April 28 Earlseat Fife Wemyss Coal Co Ltd William Linn 23 Miner Falls of roof A newly opened longwall section had taken the first break; and after the roof had settled, deceased and another miner were repairing the roadway for the purpose of re-starting the faces, when the roof overhead suddenly burst. 1905 May 1 Newbattle Edinburgh Lothian Coal Co Ltd Alexander Jack 19 Coal cutter attendant Falls of roof Deceased attended to a coal cutting machine, putting up props, &c., and while engaged at the face, a fall of roof took place, completely burying him. 1905 May 9 East Rougrigg Stirling A Forrester & Co Ltd William Ferguson 35 Check weigher Deaths not comprised under Mines Act Was proceeding homeward after his shift was over and took ill a few yards from the pit, and died in a short time. 1905 May 10 Braidhurst Lanark Summerlee Iron Co Ltd James Inglis 29 Repairer Falls of roof Deceased was timbering a main road, when temporary supports gave way causing the roof to fall and burying him beneath it. 1905 May 10 Carnock No 1 Pit Stirling Alloa Coal Co. Ltd James Gaddie 52 Sinker Shaft accidents  overwinding The engineman in some unexplained manner overwound the kettle in which they were ascending. 1905 May 10 Nethercroy No 1 Pit Dumbarton Carron Co. John Mackay 45 Bricklayer's labourer In shafts  miscellaneous While attempting to pass through the cage seat the cage came down upon him. 1905 May 11 Riddochhill Linlithgow Gavin Paul & Sons Ltd Michael Reilly 35 Roads man Falls of roof Deceased was assisting to repair a roadway, when the roof fell upon him, and he was injured. He died two days afterwards from his injury. 1905 May 15 Victoria No 2 Pit (ironstone) Renfrew Wm. Baird & Co. Ltd Wm. Taylor 51 Miner Falls of side Fall of ironstone and roof, owing to a want of sprags. 1905 May 19 Clyde-Backmuir No 2 Pit Lanark Wilsons & Clyde Coal Co., Ltd. Jas. McKillop 27 Miner Shaft accidents  falling into shaft from the top He either fell or flung himself down a blind pit under the effects of the fumes from an underground fire. From Main body of report: An unusual kind of accident resulting in the death of a miner occurred in Backmuir No 2 Pit, Clyde Colliery. A fire broke out in a haulage engine-room near the pit bottom, and the intake air carried the smoke into the workings and alarmed the miners on the afternoon shift. Five of them, being unable to escape on account of the fumes, tore down a cloth stopping and went to the top of a blind pit where they remained, awaiting their rescuers. When the rescuers reached them they found 4 men, all insensible except one who stated that the deceased seemed to have gone mad and jumped down the blind pit ( a depth of 12 fathoms), in spite of all he could do to prevent him. There was no fence round the top of this blind pit which was not in use, but as the tight cloth stopping or screen referred to shut off the only entrance to it, it could hardly be held that there was a culpable neglect of the rule requiring the top of every shaft to be fenced. 1905 May 21 Lochgelly Fife Lochgelly Iron & Coal Co Ltd William Drummond 51 Pit wright On surface  miscellaneous Deceased was assisting to take down a range of steam pipes, and in doing so stood on a scaffold 12 ft. up from the ground. When the bolts had been taken from a level joint the pipes swung, and the bend fell away and he was carried with it. 1905 May 24 Dunsyston Lanark Summerlee Iron Co Ltd James Sneddon 60 Miner Other haulage accidents Deceased and his two sons were proceeding up an endless rope haulage roadway after their day's work was finished, when an empty tub slipped from the rope, and coming back struck deceased as it passed, inflicting a severe flesh wound on his right leg. Blood poisoning supervened and he died 14 days afterwards. The tubs were put on the rope singly and held by a Smallman clip, and the " gabby " dropped out. The roadway dipped in-bye 1 in 7. 1905 May 25 Balbardie Linlithgow Balbardie Colliery Co Ltd Alexander Reid 42 Miner Falls of side Deceased was adjusting a suction pipe near a dook face when a stone fell from the side upon him. 1905 May 25 Dalbeath Fife Fife Coal Co Ltd Robert Barclay 24 Miner Falls of side Deceased was holing coal when it fell away from between two lypes and fatally injured him. 1905 May 30 Bannockburn No 1 Pit Stirling Alloa Coal Co. Ltd James Brown 25 Brakesman Haulage  By machinery While running a race on a self acting incline the brake gave way and the lever struck him on the head. 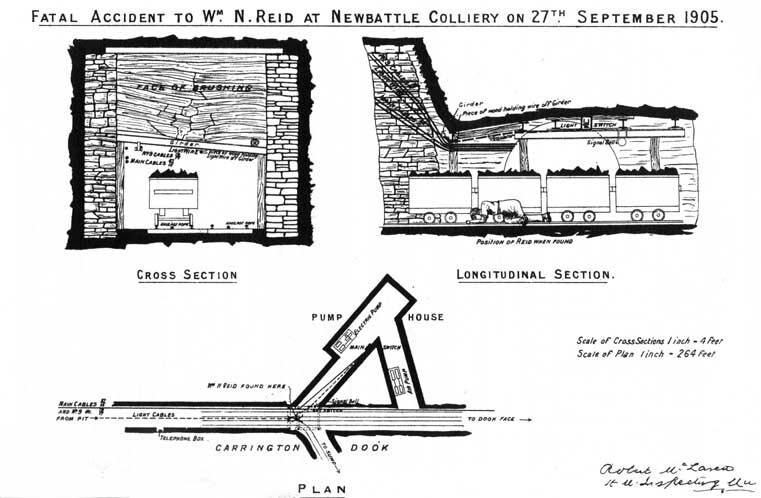 1905 May 31 Rosehall No 3 Pit Lanark R. Addie & Sons' Collieries, Ltd. Jas. Caldwell 21 Miner Falls of roof Fall of roof at working face while holing or taking down coal. 1905 June 7 Shields Lanark Glasgow Iron & Coal Co Ltd Thomas McGarry 16 Miner Explosions of fire damp or coal dust See Report, p. 12. From Main body of report: This accident occurred in a disused road in Dook Section of Main coal, which was left standing on a down hitch. The place where deceased worked was stripping the same hitch on the left hand side, and was going toward the disused road almost at a right angle. The seam is worked stoop and room with stoops 160 ft. square and openings 12 ft. wide: the dip is 1 in 20. The air current to ventilate the workings passed in from the downcast shaft through a cross-cut mine to the Splint coal, where it split, one part going to the Main coal by another cross-cut mine, and after traversing the workings passed up a blind shaft again to the Splint coal and from thence by a parallel cross-cut mine to the upcast shaft at top of which a Capell fan operated. The ventilating current for the working places was led in by brattice cloth, and to keep the disused place clear of gas, brattice was also put in to within a few feet of the hitch. On the morning of the accident, immediately after breakfast, deceased went round to the disused road to give the miner a "chap" in order to ascertain how much coal was still to be cut to join the places, and when about 32 ft. from the face his naked light ignited gas and an explosion occurred whereby he was seriously burned on the arms and face, and died next day. There had evidently been a large accumulation, as nearly all the men's lights in the section were extinguished, although very little damage was done to property. Gas had not been seen in the place, prior to the explosion, but a slight fall, of roof had taken place at the face of the hitch right up to the bottom of the Pyotshaw coal, and this had apparently liberated the gas. There was no proper fence to prevent any one going into the disused road. For reasons which I did not consider satisfactory, the manager altered the system of ventilation within a few hours after the accident by reversing the air current. Proceedings were instituted against the manager and fireman for contravention of the rules, and convictions obtained. 1905 June 16 Gauchalland No 4 Pit Ayr Gauchalland Coal Co. Wm. Paton 59 Miner Falls of side Fall of stone (falling) from the working face. Apparently he failed to examine it after a shot was fired. 1905 June 21 Huntershill Mine (sandstone) Lanark Thos. Gibb & Sons, Ltd. Charles Lind 21 Labourer In Metalliferous Mines  Miscellaneous underground accidents He fell over the face of a bench of stone from a height of thirty feet. From Main body of report: The sandstone worked for building purposes is over 30 feet in thickness, and miners are employed to remove the upper portion of the bed preparatory to the quarrymen proper commencing operations. The deceased was working with the miners, and while shovelling debris over the face of the bench, in some unexplained manner he fell over and was killed. Deceased had left the brushing face to get his lamp replenished with oil, and while filling the lamp a stone fell upon him. He died from his injuries on 28th January, 1906. 1905 June 28 North Motherwell Lanark Merry & Cunninghame Ltd William Weir 68 pitheadman On surface  miscellaneous Deceased and another workman were loading old wire ropes into a waggon by rolling the coil to the low scaffold, raising it by the cage and putting it down the screen, and while doing so the palm of his left hand wag pricked by a broken wire; blood poisoning supervened, and he died nine days afterwards. 1905 June 28 Roman Camp (Oil shale) Linlithgow Broxburn Oil Co Ltd Owen Feeney 40 Miner Other haulage accidents No one saw this accident, but from the position in which he was found, and other circumstances, it seems he was struck by the '' cuddie" tub as it passed down the brae. 1905 June 30 Cobbinshaw Edinburgh Cobbinshaw Coal & Iron Co Ltd John Murray 63 Miner Deaths not comprised under Mines Act Deceased was found dead in his working place ; death due to natural causes. 1905 July 3 Lumphinnans Fife Fife Coal Co Ltd Robert Torrance 42 Miner Falls of roof Deceased was engaged holing his coal, when a large stone fell from the roof upon him causing injuries from which he died two days afterwards. 1905 July 5 Orbiston Nos 1 & 2 Pits Lanark Summerlee & Mossend Iron & Steel Co. Ltd. Anthony Dickson 53 Miner Falls of side Fall of coal while enlarging a road. 1905 July 8 Parkhead Lanark Glasgow Iron & Steel Co Ltd Alexander Dixon 24 Fireman Shaft accidents – falling into shaft from surface Deceased was engaged with others in "taking up" the winding rope of one side of the shaft, and for that purpose the rope was held in the shaft by glands fixed on two beams, laid on loose planks across the shaft mouth at the low scaffold. After the work was completed the .beams were being removed, and deceased was at one side pulling with the beam between. his legs, and when the beam was moved the plank moved also and the opposite end falling into the shaft the end at which deceased was, caught him as it descended and he was thrown forward and precipitated to the bottom. The planks should have been secured. 1905 July 8 Shaws No 2 Pit Lanark United Collieries Ltd. Patrick Casey 19 Miner Falls of roof Fall of roof in working place in machine wall. The fall crushed out the props. 1905 July 10 Clyde- Wellhall Pit Lanark WIlsons & Clyde Coal Co., Ltd. John Paterson 16 Pithead labourer In shafts – miscellaneous While on the cage adjusting an empty hutch the engineman lowered the cage and he got crushed. The cage was lowered without the prescribed signal from the pithead having been given. 1905 July 12 Pennyvenie No 3 Pit Ayr Dalmellington Iron Co. Ltd John Baillie 13 Drawer Haulage – Run over or crushed by Trams or Tubs In coming out a level with a full hutch his light went out. Another drawer coming behind, not seeing him, ran against him with his hutch. 1905 July 26 Lumphinnans Fife Fife Coal Co Ltd Alexander Wyse 16 Pony Driver Miscellaneous underground – sundries Deceased put the tail chain on a rake of loaded tubs to side pull forward to the shaft, and when the tubs had moved a few yards the horse fell, and he was crushed beneath it. 1905 July 28 Dechmont No 2 Pit Lanark Archd. Russell, Ltd. Patrick Murray 37 Brusher Falls of side Fall of side in working place while putting in a building. 1905 July 29 Shawfield Lanark Wilson's & Clyde Coal Co Ltd John Morris 28 Fireman Shaft accidents -things falling from part way down Ladders were being fixed in a blind shaft communicating two seams, and while deceased was ascending the ladders already in, with a plank on his shoulder, another plank fell from above and struck him. The plank which fell was being put in as a bunton on which to make a landing, and the person fixing it mis-hit a nail, and the bunton slipped from its position and went down the shaft. 1905 August 9 Dalquhandy No 1 Pit Lanark Waddell & Son Hugh Blackwood 15 Pony driver Falls of roof He had gone into a working place for a hutch when the roof fell on him. 1905 August 16 Minto Fife Lochgelly Iron & Coal Co Ltd George Christie 39 Coal cutting machine driver Miscellaneous underground – by machinery Deceased stepped across the bar of a coal-cutting machine while it revolved, and his legs were caught by the picks. The bar had only cut a few inches into the coal, and was working quite satisfactorily, and no reason can be assigned why deceased stepped across. From Main body of report: One fatality occurred due to this cause [machinery]. An electrically-driven bar coal-cutting machine had been introduced into a seam, and deceased, who was an expert in the working of it, was employed to look after it until the men who were to take charge got acquainted with its working parts. The machine cuts the coal by means of a revolving tapered bar on which picks are fixed at intervals, and while the bar was in motion he stepped across it apparently to see if it was d6ing its work satisfactorily, and was caught by the picks. 1905 August 16 Thankerton No 7 Pit Lanark J. McAndrew & Co. John Brown 52 Miner Falls of roof Fall of roof on road; a hutch on which they were riding, Brown illegally, having gone off the rails and knocked out the timbering. 1905 August 18 Craighead No 1 Pit Lanark Wm. Baird & Co. Ltd Robert Smith 22 Bogie man Haulage – Run over or crushed by Trams or Tubs He fell off the bogie in front of the race which went over him. 1905 August 18 Stane Lanark Turners Ltd Robert Roy 16 Miner Deaths not comprised under Mines Act Deceased came up the shaft, and began to run after the girls employed on the pithead, and in chasing one he came into violent contact with the lever of the weighing machine, causing injuries whereby he died the same day. 1905 August 19 Whiterigg Linlithgow R Forrester & Co Ltd Smith Tennant 47 Miner Falls of side Deceased's working place took a heavy crush causing the face coal to fall and injure him. He died fourteen days afterwards. 1905 August 22 Broxburn (Oil shale) Linlithgow Broxburn Oil Co Ltd Robert Pratice 38 Miner Falls of side The top shale fell away suddenly on deceased, killing him instantaneously. 1905 August 25 Rosie Fife Wemyss Coal Co Ltd Bernard Thomson 16 Drawer Falls of side Deceased was turning back coal from a dropped-out room in second working of Chemiss Seam when a sudden burst of coal came away from the stoop side, and striking him he was killed instantaneously. 1905 August 29 Allanton No 1 Pit Lanark Wm. Barr & Sons John McLaren 45 Miner Falls of roof Fall of roof in working place. It is doubtful if props were set as required by the regulations. 1905 September 4 Bedlay Colliery Lanark Wm. Baird & Co. Ltd John Banks 20 Engineer On surface – sundries While shifting a heavy casting belonging to a steam crane which was being put up, it canted and fell over on him. 1905 September 4 Orbiston No 3 Pit Lanark Summerlee & Mossend Iron & Steel Co. Ltd. Alexr. Paterson 27 Waggon shifter On surface – On railways, sidings, or tramways When crossing the rails in front of waggons which he was shifting, his foot got caught in a crossing, and he was run over before he could extricate himself. 1905 September 7 Bailliesmuir Lanark Coltness Iron Co Ltd James Cullen 16 Miner Falls of roof Deceased was at the road head, when the face coal fell, knocking out a prop, and causing the roof to fall on him. He died four days afterwards from his injury. 1905 September 9 Broomrigg No 3 Pit Stirling Banknock Coal Co. Ltd. John Neil 58 Miner Falls of side Fall of coal while holing. 1905 September 13 Dunnikier Fife Walter Herd & Son Ltd Benjamin Proctor 20 Drawer Falls of side Deceased was engaged during the morning repairing a level road, and when repairs were almost finished he left and proceeded to the coal face, and when there a piece of coal fell away from between two sprags on him. The sprags were 6 feet 6 inches apart. 1905 September 13 Muirbeath Fife Henry Ness & Co Ltd Alexander P Campbell 14 Coupler Falls of roof Deceased was about to take an empty tub across the plates at the pit bottom, when a large stone fell from the roof and killed him instantaneously. 1905 September 14 Wester Queenslie No 1 Pit Lanark John Allan Thos. Steedman 55 Miner Falls of roof Fall of roof at working face while filling a hutch. 1905 September 21 Blantyreferme Colliery Lanark A. G. Moore & Co. Joseph Rodgers 22 Miner Haulage – Run over or crushed by Trams or Tubs While illegally drawing in front of a hutch he lost control of it and was run over. 1905 September 21 Oakbank (Oil shale) Edinburgh Oakbank Oil Co Ltd John Watson 27 Drawer Falls of side Deceased was left by the faceman to fill and draw shale which had been dug, and while filling a tub the top shale suddenly fell and crushed him fatally. The shale fell away from " foul skins " due to the presence of a "hitch'' and which were partly seen. There were no sprags up to the top shale. 1905 September 27 Glencraig Fife Wilson's & Clyde Coal Co Ltd Alexander Erskine 21 Drawer Haulage – run over or crushed by trams & tubs Deceased was employed by a contractor who worked in a heading rising 1 in 3.5, and a branch. The coal was run to the level by means of a ''cut," the wheel being at the top. The places were worked alternately and the branch was at work at the time of the accident. When the heading was last worked a loaded tub was left standing on the level rails and the rope was constantly rubbing on it in moving up and down. A tub was being run from the branch, and just as it moved away the tub from above ran away and about 100ft. down it crashed into the other, crushing deceased between ; the sudden collision caused the rope to slip a hose and both ran down carrying deceased between them, and at a high part of the roadway the runaway tub passed over the other. The constant movement of the rope on the tub had eventually brought it to the steep. It was said the tub was secured by sprags in the wheels, but it is evident it was insufficiently secured. 1905 September 27 Lumphinnans Fife Fife Coal Co Ltd David McLeod 65 Miner Falls of roof Deceased was sitting at his breakfast when the roof suddenly fell upon him. A hitch had been met with and a part was "won out" inside, and the roof fell away from the "vees." The power was generated by coupled compound dynamos on the surface, each of 135 amperes and 500 volts continuous current. This current was carried by two cables composed of 37.15 w.-g. wires down the Carrington dook of the Parrot coal seam for a distance of 1 1/2 miles. At the in-bye end was a switch room from which two subsidiary cables of 19.17 w.-g. wires came out to the roadway leading to the faces where coal-cutting machines were in operation. From the positive cable of the main cables a wire was led and joined to the negative cable, and between the terminals of the wire, lamps were placed at intervals to light up the haulage lye. In the lye therefore in the centre of road there were at the time of the accident two sets of cables and the lighting wire. The roadway is double for endless rope haulage and was being heightened during the back shift, and the cables and wire were suspended temporarily from the heightened part and carried under the lower part which was under repair ; just at the entrance to the lower part and on the lip of the unbrushed part was a steel girder, and cables and wire were in contact with it. Deceased's duties were to assist in making up the sets of tubs to the in-bye end and also to the shaft, and had only begun work on the day of the accident. Owing to the heat, over 70° F., he perspired very much and worked without his cap, and the pavement was wet, which caused his feet to get damp. No one saw what actually took place, but some men on their way out-bye after their work was over for the day discovered him lying on the roadway for the empty tubs apparently dead, and they at once applied artificial respiration for fully an hour without avail. Where deceased was found was almost directly under the steel girder at x where cables and wire passed under. It was supposed he had in some way received an electric shock, and on making an examination it was discovered that about 1 1/2 inches of the tape insulation of the lighting wire had been removed, and the bare wire being in contact with the girder charged it with the current. It was estimated that the voltage at the point of contact was about 450. In order to ascertain the exact cause of death a post-mortem examination was made, and a mark was found across the back showing indications of burning, and the medical report stated that death was due to electric shock. While attending to his duties deceased had to pass and re-pass under the girder, which was 5 feet above the rails, and he had touched it while on his way to attend to the tubs, and being in a state of perspiration, and his feet damp he was a fit subject for a fatal shock. 1905 October 2 Haugh No 2 Pit Stirling Wm. Baird & Co. Ltd David Marshall 14 Drawer Shaft accidents – whilst ascending or descending by machinery When stepping off the cage at the pithead after ascending he was caught by the cage being lowered before he got clear, in response to a hand signal given by the bottomer who also ascended in the same cage. 1905 October 3 Broxburn (Oil shale) Linlithgow Broxburn Oil Co Ltd Hugh McCord 37 Miner Falls of side Deceased was taking down the top shale when it fell away and fatally crushed him. 1905 October 3 Pumpherston No 5 (Oil shale) Edinburgh Pumpherston Oil Co Ltd John West 45 Mining contractor Other haulage accidents Deceased worked in a sinking dook, and the tubs were drawn from it and the benches above by means of a main dook rope, in rakes of four. A rake was lifted from a bench above, and when it was up some distance the last tub uncoupled and running back dashed into a scaffold on which some miners stood to timber the roof, and a piece of wood splinter was forced down on him. The coupling used was a ram's horn, and it had been put into the tub with a twist, and by the jerking had come out. A "jock" was provided to attach to the last tub, but the chainer neglected to put it in. 1905 October 9 Riddochhill Linlithgow Gavin Paul & Sons Ltd Malcolm Wilson 28 Miner Shaft accidents – whilst ascending or descending by machinery Deceased with seven others, was ascending the shaft, after the day's work was finished, carrying some picks with him, and when some distance up he fell out of the cage. It is supposed that in attempting to save his picks, which he had between his legs, from falling into the shaft, he overbalanced. From Main body of report: One fatality was caused by a workman falling out of the cage while ascending the shaft ; he had some tools with him and apparently some of them were about to fall into the shaft, and in trying to prevent this he overbalanced and fell over the cage end. The habit of carrying tools while riding on the cage is a bad one, and should not be permitted. 1905 October 16 Loanhead Edinburgh Shotts Iron Co Ltd James Robertson 20 Miner Falls of side Deceased was taking coal off the face in the steep workings, and when it fell he was unable to clear himself and was crushed. He died from his injuries 17 days afterwards. 1905 October 21 Swinhill No 5 Pit Lanark Darngavil Coal CO. Ltd Alexr. Torrance 30 Weigher On surface – sundries A line of 9 inch pipes was being taken down, and the supporting trestles having swung, he was struck by a falling pipe. 1905 October 22 Kinneil Linlithgow Kinneil Cannel & Coking Coal Co Ltd Robert Murray 48 Brusher Falls of roof Deceased and another were ripping a horse road, when a stone fell from the roof and injured him. He succumbed five days afterwards. 1905 October 25 Lochwood No 3 Pit Lanark Lochwood Coal Co., Ltd James Nicoll 17 Drawer Haulage – Run over or crushed by Trams or Tubs While illegally drawing in front of a hutch he fell and got crushed against a prop. 1905 October 26 Dockra No 1 Pit (Ironstone Mine) Ayr Glengarnock Iron & Steel Co. Ltd Thos. McCann, jr. 16 Chain runner Haulage – Run over or crushed by Trams or Tubs In some unexplained manner he was run over by a “race” of full hutches which he was taking up a dook. 1905 October 26 Dunnikier Fife Walter Herd & Son Ltd Richard Walters 68 Miner Other haulage accidents A horse rake consisting of five tubs was proceeding out-bye, and deceased and three others rode on the tubs; on the way out the last tub occupied by deceased left the rails and he was thrown off and was pricked on the right leg by one of several picks he had with him. Blood poisoning set in and he died eight days afterwards. 1905 November 3 Arniston Edinburgh Arniston Coal Co Ltd Robert Cunningham 42 Boiler fireman On surface – miscellaneous In front of boilers was a dross hole, divided into two, one portion had a capacity to hold about 80 tons of dross, a retaining wall 20 inches thick faced the boilers, and at intervals, opposite each boiler, were openings to allow the dross to gravitate so as to be reached by the firemen. This wall without any warning suddenly collapsed, and deceased, who was opposite, was buried. 1905 November 3 Dunsyston Lanark Summerlee Iron Co Ltd John Myles 19 Drawer Haulage – run over or crushed by trams & tubs Deceased was sitting in the siding waiting on a tub when two empty tubs ran away from the haulage rope and crushed him. The system of haulage is endless rope, single tubs, and tubs are attached to the rope by Smallman clip. The cause of the runaway was due to "gabby" becoming detached from the tub link. The road dips in-bye 1 in 7. 1905 November 3 Hill of Beath Fife Fife Coal Co Ltd John Steuart 37 Waggon repairer Deaths not comprised under Mines Act Deceased was employed by the Lochgelly Iron & Coal Co., Ltd., at Little Raith Colliery, on the south side of the Dunfermline & Thornton Railway, A train of waggons was shunted into Hill of Beath sidings on north side of said railway, and he crossed over for some purpose and was crushed between the buffers of waggons. Fall of roof in working place, owing to the want of prop. Injured on 6th November, 1905, and died on 11th June, 1906. 1905 November 6 Newbattle Edinburgh Lothian Coal Co Ltd John McGuire 36 Miner Falls of side Deceased was about to take down coal when it fell and crushed him against a prop. 1905 November 9 Bedlay No 1 Pit Lanark Wm. Baird & Co. Ltd John Mullan 45 Sinker Miscellaneous Underground Accidents – By explosives When working with a pick to recover a charge of gelignite which had missed fire he exploded the detonator and primer. 1905 November 10 Gartshore No 2 Pit Dumbarton Wm. Baird & Co. Ltd Laurence McBride 15 Drawer Haulage – Run over or crushed by Trams or Tubs When taking an empty hutch down a dook he was overtaken by empty hutches knocked over the brow of lye above by a “race” being set back against them. 1905 November 16 Dalquhandy No 1 Pit Lanark Waddell & Son John Donaldson 42 Miner Falls of roof Fall of roof in working place while redding. The roof was not propped as required by the regulations. 1905 November 17 Newbattle Edinburgh Lothian Coal Co James Davidson 14 Pithead runner On surface – by machinery Deceased stepped across a creeper chain for hauling empty tubs, to light gas at a bracket on the wall, and his right leg slipped into the wheel opening and was severely lacerated. He died from blood poisoning two days afterwards. From Main body of report: One death was by machinery, and was caused by a boy attempting to do a thing he had no need to, being caught with a " creeper " used to raise empty tubs up a rising plane from a lower to a higher level. 1905 November 20 Simpsonland No 2 Pit Lanark United Collieries Ltd. John McLean 58 Miner Falls of side Fall of coal. He failed to stand clear of a cut of coal which his neighbour was wedging down. From Main body of report: The three fatal accidents by machinery were all caused by the want of care on the part of the sufferers. The first, resulted in the death of Mr William Barr, one of the owners of Bellfield Colliery, Lanarkshire. He had gone close to a horizontal revolving shaft which was not fenced as required by the regulations. The shaft was 16 inches above the floor, and it seems that it caught his loose overcoat, drew him in and inflicted fatal injuries before the machinery could be stopped. In July 1904, I pointed out to the deceased unfenced machinery at the place where this accident occurred, and it was then fenced; but since that time alterations in the machinery were made, and the fencing was again neglected. 1905 November 23 Newbattle Edinburgh Lothian Coal Co Ltd Joseph Thomson 65 Miner Deaths not comprised under Mines Act Deceased suddenly expired at his working face. Hie death was due to natural causes. 1905 December 2 Bothwell Castle No 4 Pit Lanark Wm. Baird & Co. Ltd Thos. Foley 53 Miner Falls of roof Fall of roof on road while brushing it. 1905 December 2 Wallyford Edinburgh Edinburgh Collieries Co Ltd John McGhee 51 Miner Falls of side Deceased was "shearing" in the right-hand side of a close place to relieve his coal when it suddenly fell away, and in trying to clear himself he slipped on the pavement in front of it, and was killed instantaneously. 1905 December 6 Newbattle Edinburgh Lothian Coal Co Ltd George Ritchie 14 Miner Explosions of fire damp or coal dust See Report, pages 12, 13,14. From Main body of report: This explosion occurred on 6th December, 1905, in a section of a longwall working of Parrot Coal Seam. A fall of roof took place across several places liberating some gas which lodged at the top. Men were engaged "winning out" inside the fall at the extremities, and this work was almost completed when the accident took place. The fireman of the section was aware there was gas at the top of the fall, and notwithstanding he appears to have gone up with a naked light and ignited it causing it to explode, whereby the flame travelled to where the men were at work burning them. An. examination of the section was made next day and gas was found in several of the roads. Owing to the fall the ventilating current was less than usual, but no effort was made by the officials with the air current available to clear out the gas. It transpired that the fireman had very little experience of gas, and probably knew nothing of the dangers or how best to deal with it. 1905 December 7 Cadzow Colliery Lanark Cadzow Coal Co. Ltd. James Kirk 45 Brakesman On surface – On railways, sidings, or tramways Without authority he attempted to work a locomotive. He lost control of it, and it ran into a waggon that the driver was shunting. 1905 December 9 Callendar Stirling Callendar Coal Co Ltd James Lockhart 45 pitheadman On surface – railways, sidings or tramways Two loaded dross waggons were being moved forward to rest against another in front and just as they were about to collide deceased stepped between and was crushed between the buffers. 1905 December 13 Broomhouse Colliery Lanark Haughhead Coal Co. Ltd Henry Whyte 46 Waggoner On surface – By machinery When about to apply the brake of one of seven waggons in motion, a locomotive gave them an extra push. He fell on the rail, and the wheel of the following wagon fatally injured him. 1905 December 16 Herbertshire No 2 Pit Stirling R. Addie & Sons' Collieries, Ltd. Michael Connley 14 Scree engineman On surface – On railways, sidings, or tramways Caught by bevel wheels of machinery close to which he was working. 1905 December 25 Calderbank No 1 Pit Lanark United Collieries Ltd. Francis Green 60 Miner Shaft accidents – things falling into shaft from surface When stepping into the cage to ascend he was struck on the head by a piece of coal which fell from a hutch being taken off the cage at the surface. 1905 December 28 Auchinreoch Colliery Stirling Wm. Baird & Co. Ltd Jeannie McGhee 19 Stone picker On surface – By machinery For some unknown reason, she went over a fence and got caught by the blades of a dross conveyor. 1905 December 28 Cadder No 15 Pit (Ironstone) Lanark Carron Co. Terrence Travers 58 Miner Falls of side Fall of ironstone while holing. 1905 December 29 Earnock No 1 Pit Lanark John Watson, Ltd. Hugh Carlin 34 Reddsman Falls of roof While taking out props at a “stoop” the roof gave way, and he was caught. 1905 December 29 Muirbeath Fife Henry Ness & Co Ltd James Whyte 43 Repairer Falls of side Deceased was "needling" the side for the purpose of putting up a crown to support the roof of a roadway which was being repaired, when the side and roof suddenly fell. 1905 December 30 Balbardie Linlithgow Balbardie Colliery Co Ltd James M Tennant 32 overman Miscellaneous underground – sundries Deceased was superintending the work of putting a wooden beam to the roof for haulage extension purposes, and when the beam was raised to be put into position it swerved, and the men losing control of its movement it fell and fatally crushed him.